The image to the left plays with perception of scale. 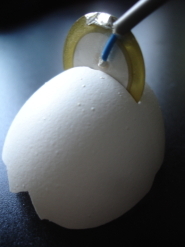 That circular saw diving headlong into the white dome is not, in fact, a saw at all, but a tiny exposed contact microphone whose sharp metallic edge has cleanly sliced through a halved eggshell. What that mic, along with others like it, located in such brittle environs is exposed in four MP3s posted in a LiveJournal entry by Steve Burnett (aka Subscape Annex, at badger.livejournal.com), one of the participants in a recent sound-art festival, The Sound of Re-use, held in Australia. Two of the tracks are inherently abrasive, less compositions than topological tours of the objects, all rough surface and grainy detail. Burnett states that he deemed these too noisy for his performance at the festival, the munchy rhythms of “Shards 2: Steam Time” (MP3) and the scratchy activity of “Shards 3: Steam End of Time” (MP3), the latter of which rises into a violent whorl. The two tracks that made Burnett’s fest set list are, indeed, less antic, more exploratory, and both benefit from a healthy does of echo, which no doubt smooths the edges inherent in the source material. “Shards 1: Monks of Dagon” (MP3) rides a dubby mantra, which provides a foundation for a rumbling scrim of scraping noises. And “Shards 4: Garuda Wakes” (MP3) opens with the ebb and flow of breaking waves, only to become a hall of sonically reflective mirrors, like some nightmare sequence from Dr. Who or The Prisoner. More details on the festival at soundoffailure.com. Other festival participants included Ian Andrews, Nick Wishart, Maria Miranda, Norie Neumark and Caroline Huf.